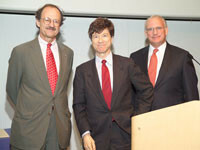 Memorial Sloan Kettering President Harold Varmus (left) and Boards Chairman Douglas Warner (right) present Columbia University economist and author Jeffrey Sachs with the Memorial Sloan Kettering Medal for Outstanding Contributions to Biomedical Research. Hideki Makinoshima (left) receives a Research Fellow Award from Sloan Kettering Institute Director Thomas Kelly (center). His mentor, infectious disease specialist Michael Glickman (right). Memorial Sloan Kettering President Harold Varmus (right) congratulates Memorial Sloan Kettering structural biologist Chris Lima, recipient of a Boyer Young Investigator Award.